OK, all you color-loving people! Feast your eyes and fingers on this scrumptious collection of hand-dyed wool fabrics! 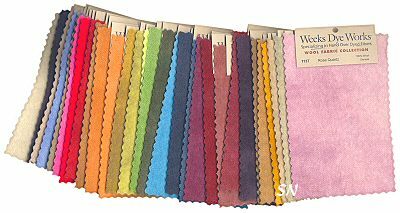 40 different colors, offered in solid, herringbone or houndstooth patterns... we have 120 different choices to tempt you! Weeks has dyed these wools specifically to match their overdyeds... so if you're doing a special project... you can match threads to the wool and know it'll look great! Offered in 1/4-yard chunks measuring approx 15 x 25 each, the hand-dying gives each piece its own individual look. Primitive-looking stains sometimes, and lots of subtle shading for extra texture and interest. Rug Hookers are slicing this up for rugs, Punch Needlers are mounting their punched projects on this -- like a mat board idea, Quilters are using this in soft-sculpture and penny rugs, Cross stitchers are using this to embellish projects like buttons would... and everybody is using it to finish and back projects! I'm sure there are tons of ways you can use this that I haven't even thought about! Absolutely breathtaking to look at and feel... I recognize the Weeks colors in their threads... and now the wool opens up so many other possibilities! You're going to love it! 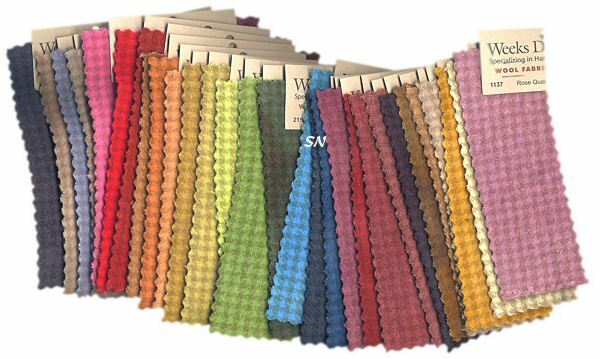 Offered in 40 colors of solids, Glen Plaid, houndstooth and herringbone patterns... we have 120 different choices to tempt you! Just put the number you want beside each color. Then be sure to scroll down to the bottom of the page to hit the "Add to Cart" button! Weeks Wools in Small Samplings! 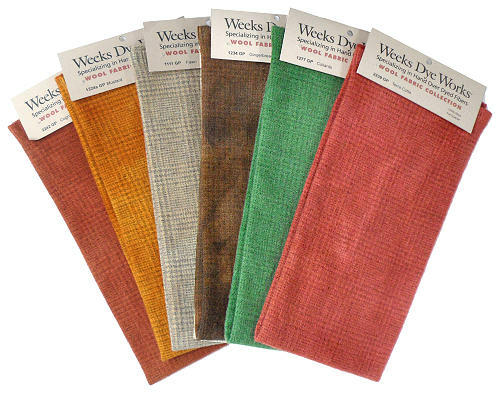 We've decided to offer our Weeks Dye Works Hand-dyed wools in small 'schnigglets' of useable sizes!!! All these wonderful punch needle designs use just bits of Weeks Wool behind them as their mounting boards... several Cross Eyed Cricket designs use Weeks Wool as backs to their individual ornaments... Homespun Elegance likes it.. Heart in Hand calls for it... Erica Michaels uses it... and lots more. Note: the Schnigglet section appears at the bottom half of this page, below the section where you can buy the 1/4 yard pieces. Look at what you can make with your Week's Dye Works Wool!!! We have a growing collection of the most delightful felted wool pin cushions designed by Just Another Button Company that feature the Week's wool!!! All of these little guys pictured (more on our JABCO Page, too!) are offered as complete kits... details on the JABCO Page. We just wanted to perch them here... so you can enjoy the colors and sheer imagination the wool offers!!! We are intriqued by the color differences the base wool provides. Here is a solid piece, the houndstooth and herringbone... all in the same color. The neat patterns provide you with complimentary patterns... in colors that all go together! Mixing design textures is a cool way to add more color -- safely! 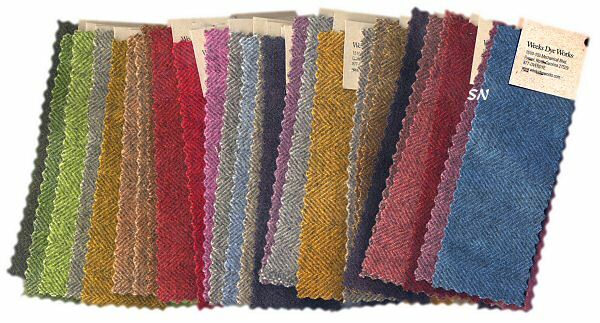 1/4 Yard Pieces -- SOLID are $26.00, Glen Plaid, Houndstooth and Herringbone are $30.00.00. Schnigglet Cuts -- approx 8 x 8 inches. Solids, Glen Plaid, Houndstooth and Herringbone are all $6.00. FYI: there is a submit buttom at the bottom... make your selections from one section at a time, using the submit button when you have chosen everything you want. Looking for the Week's Dye Works Overdyed Flosses??? Each color is listed, and all are available!